Paper is a crafters best friend! So bring out a pile of paper and have reams of fun with these paper crafts for kids. They’ll enjoy making masks, hats, baskets and other paper crafts. Assuming you’re an avid scrap-a-holic who has got tons of scrapbook paper laying around, put it to use with this fun and easy DIY paper heart garland. Whether they’re cut, folded, pasted, or printed, paper heart garlands are easy to make – and make pleasant interior home décor for birthday parties or other in-home events! Read on to find out how you can make your own DIY paper heart garland in under 10 minutes! Cut your scrapbook paper into strips. You can choose whatever width size you see fit. For this project, I used strips of about an inch wide. I also decided to use polka dot paper to make the colorful designs pop out more. You could use jet print photo paper or even newspaper! I would also maybe buy or use paper that is double-sided. If you desire a more layered touch, cut the strips into different heights. Lay each strip and layer in a sequence. For my paper heart, I used a total of 7 strips. 3 on each side of the larger, middle strip. Next, you can either staple the pieces together but I’ve found that gluing each piece together works best as well. Fold all the strips towards the center strip to make a heart-shaped piece and glue or staple to the center strip. 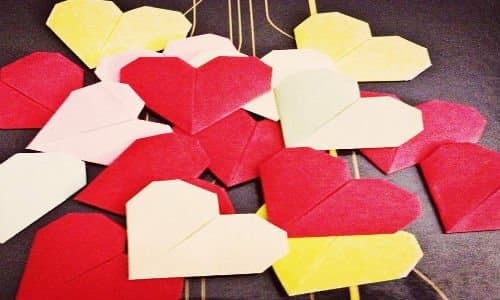 You can decorate a room with these easy-to-make hearts or punch a hole through the middle strip and string a fishing line through it and hang you new paper heart designs up! You’ll surely love how these turn out and what’s best is that they don’t have to just be Valentine’s décor!